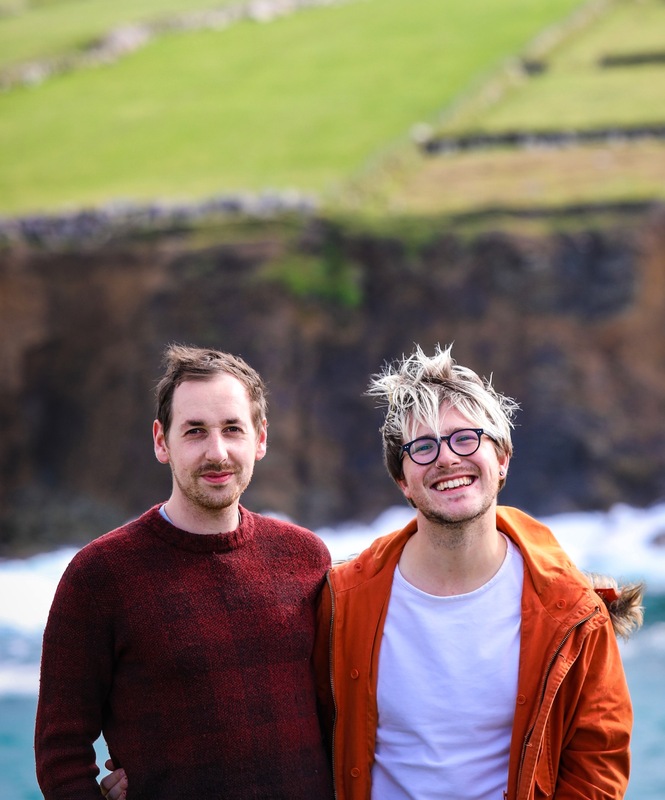 We love family-style serving, getting everyone ’round the table, popping down different dishes and each person taking their share, passing from person to person and physically interacting with their food. 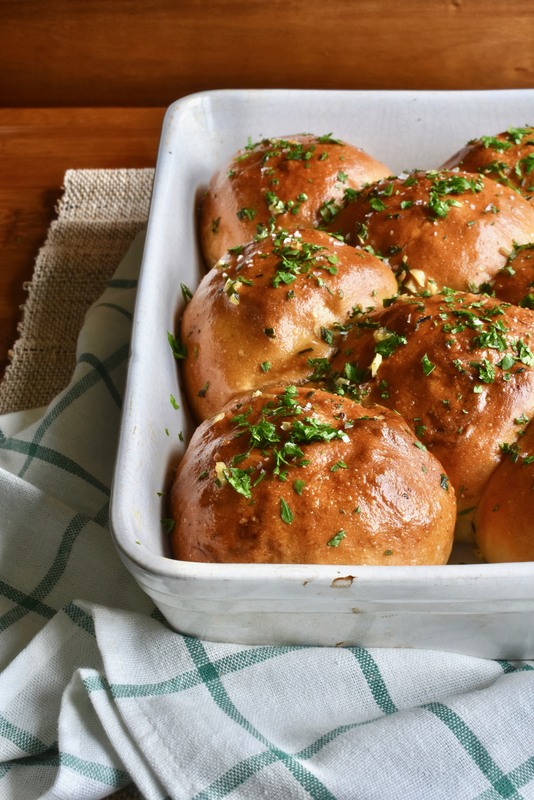 This recipe for garlic and herb tear-and-share rolls is so simple to make and turns out incredible – a star side for any family get-together, movie night or Sunday lunch spread, we guarantee! 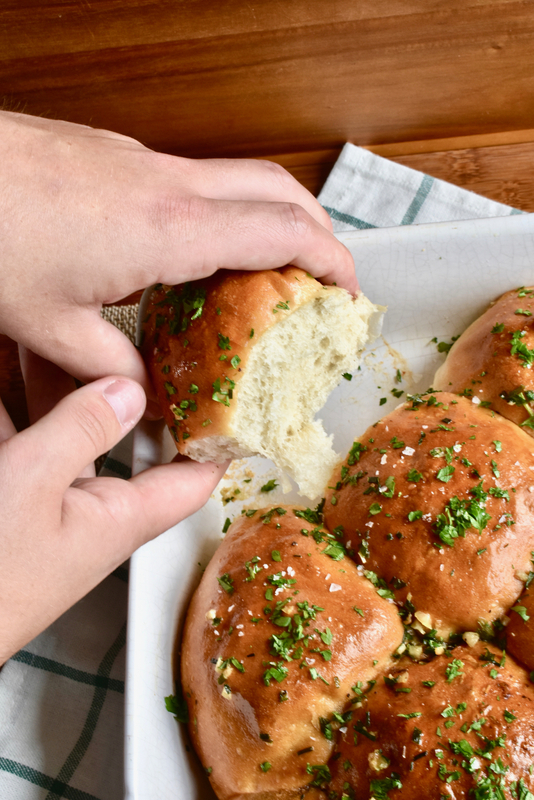 In celebration of National Bread Week (11th – 17th September 2017), we’re taking part in the Love Your Loaf campaign and sharing our great little recipe for these family-style rolls, all baked snugly together and torn off one another as needed. 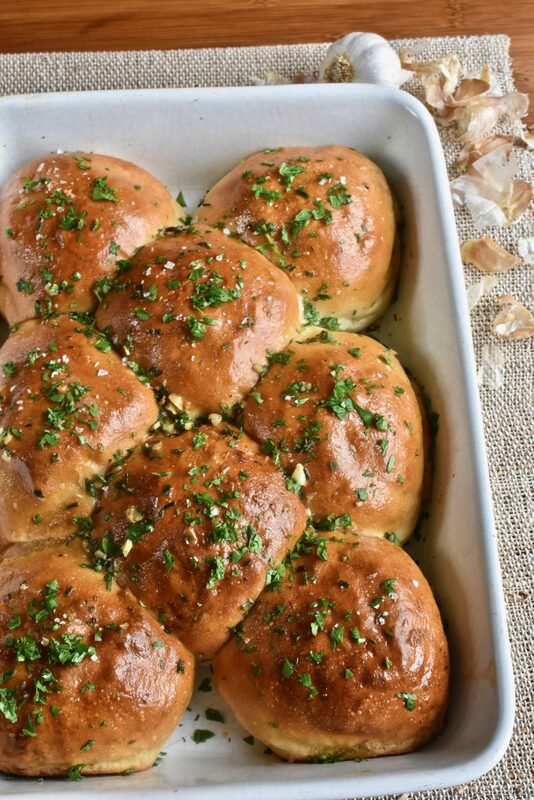 Soft, golden-glazed and filled with roasted garlic and a unique blend of mixed dried herbs, these gorgeous little rolls are ideal for mopping up meat juices or serving alongside pizza or pasta as a form of garlic bread as, though there’s garlic inside, this is also finished with a generous coating of garlic and chive butter and a smattering of finely chopped fresh parsley. You could also serve these in the middle of the table alongside a hearty, warming soup when the temperatures drop or this recipe can perfectly hold its own and stand up to some fiery Jerk chicken with creamed corn. 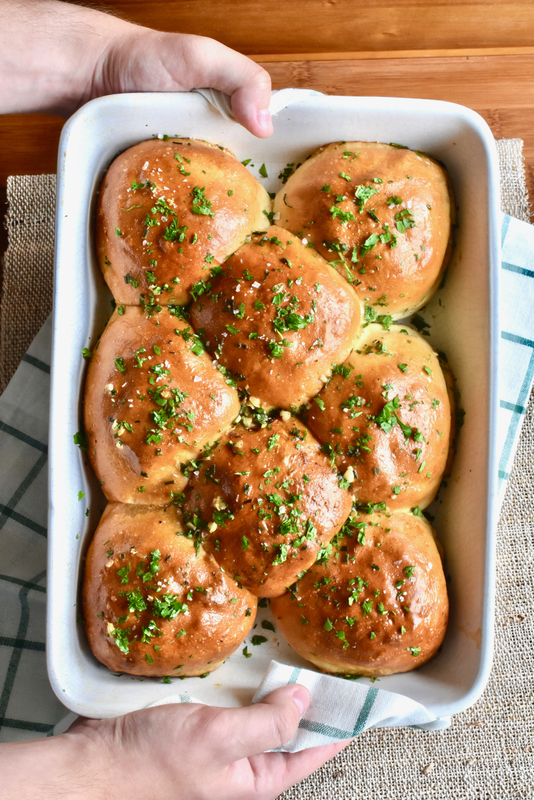 Another indulgently delicious recipe we’ve tried is slicing these rolls through the middle, layering with slow-cooked, juicy pulled lamb and crowned with pickled onions and freshly-made mint sauce. 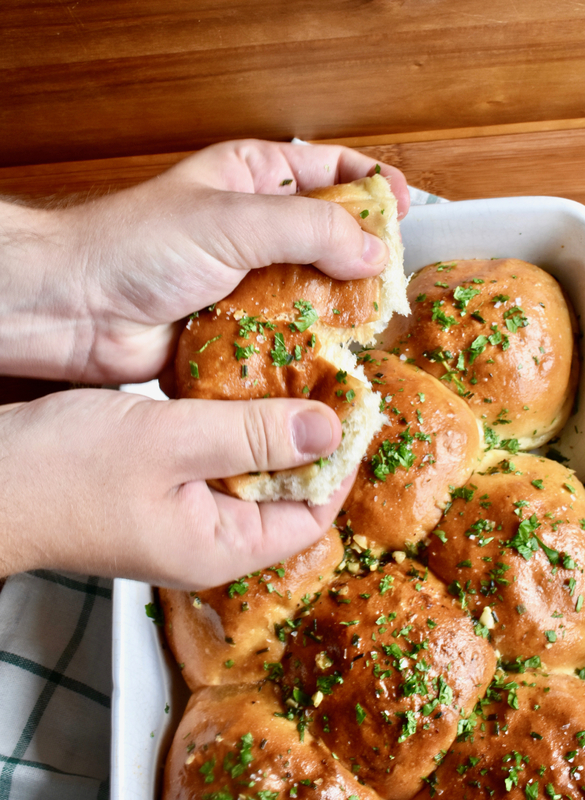 All in all, you’ll find these rolls ultra adaptable and totally delectable! 1. Dissolve the yeast in a few tbsp of body temperature tepid water, stirring well and allowing to bloom and bubble for a couple of minutes. 2. Meanwhile, combine the flour and salt in a large mixing bowl fitted to a stand mixer (KitchenAid, Kenwood, etc.). Don’t worry if you don’t have a mixer- it’s totally possible to make this recipe by hand. 3. 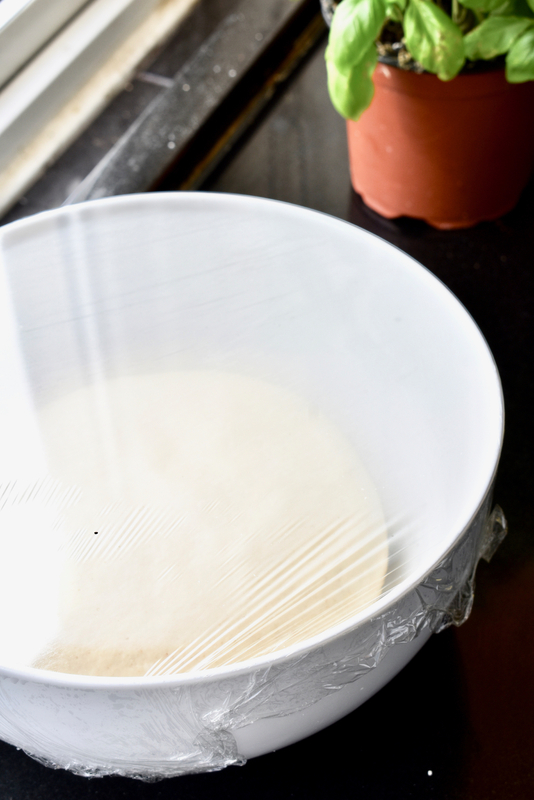 Next, add in the yeasted water and allow the machine to incorporate into a dough, you can judge the amount of water you need – you don’t want the dough to be floury at all but not too sticky that it’s unworkable either. Work the dough for 10 minutes or so on a fairly low speed. If working by hand, you may need to give it few minutes more. Cover with clingfilm and allow to prove until doubled in size. 4. Rub the garlic with a little oil to stop it sticking and wrap tightly in tinfoil. Bake in the middle shelf of an oven for 25-30 minutes at medium-high (around 180ºC) temperature. 5. 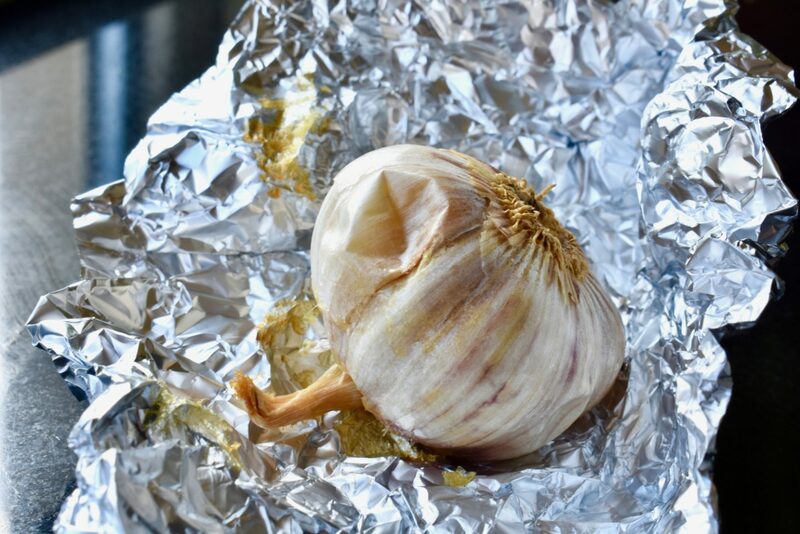 When the garlic is out of the oven, remove from the tin foil and allow to chill for a few minutes before squeezing out the flesh from each bulb. Discard the garlic ‘jackets’. Mash the flesh all together. 6. When the dough has just about doubled in size, knock it back and allow to rest for a minute before attempting to shape. 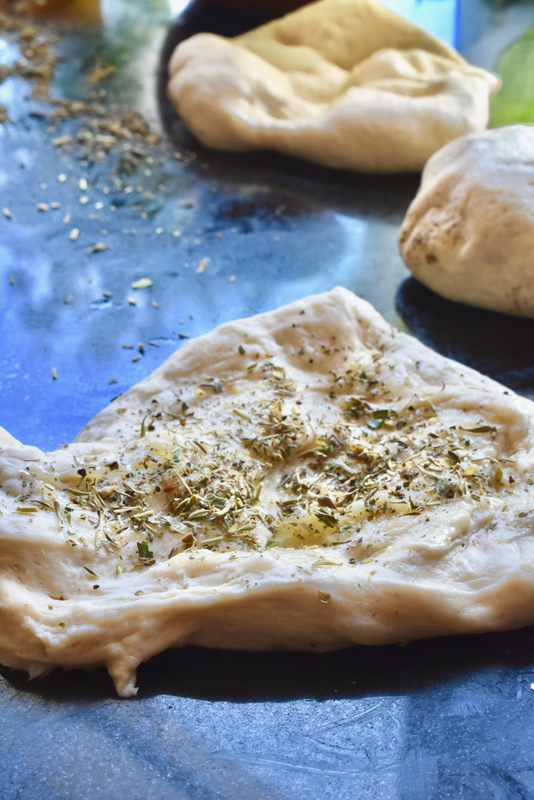 Weigh the full piece of dough and then break down into even-sized pieces of your choice. For example, we got around eight fairly large bread rolls around 85g each from a 675g dough. 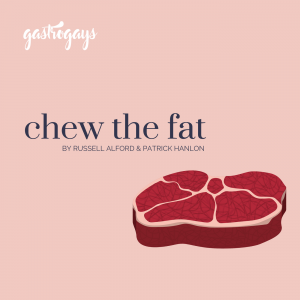 You could get 12 if you make them around 55g or even 16-18 mini ones if you make them between 38 and 42g each – obviously you will need to adjust your baking time the smaller you make your balls. 7. With each piece, flatten into a circular-ish dish under the heel of your hand and spread with around a tsp of the garlic mixture followed by a generous sprinkle of the dried herbs. Now, gather all of the ends of the dough towards the centre tautly (like you would with, say, a dumpling and the mixture within) and then turn it over and roll with your hand gently over in a claw shape to seal the join underneath. Alternatively you can bring the dough a quarter-turn towards you using the friction against the surface where you’re working to hide the seam. 8. Repeat with all of the pieces you have and line up together, flattened slightly in a lightly oiled dish or tray with high edges (like a casserole or lasagne dish). 9. Allow to prove for a second time, covering with cling film again, until doubled in size. 10. Heat the oven to 210ºC and place a baking tin at the bottom of the oven and allow to come up to temperature with the oven. Meanwhile, eggwash the tops of the bread rolls when just about ready to go into the oven. 11. 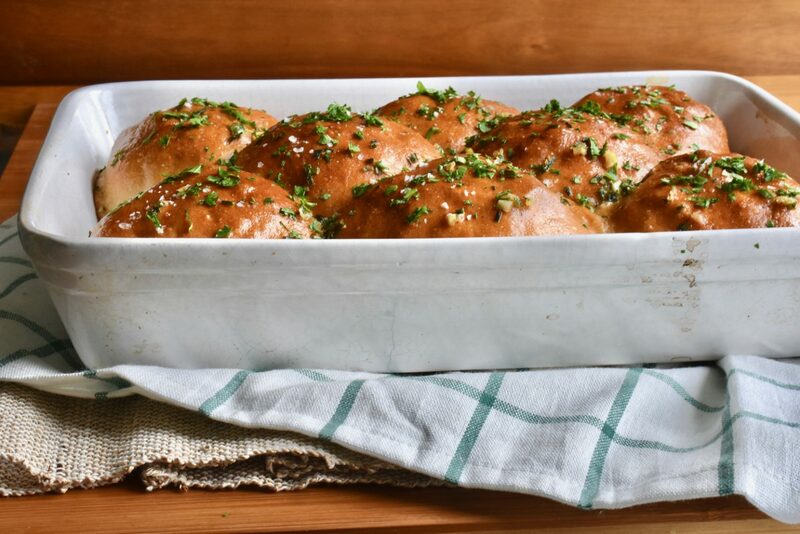 Pour a cup or so of water from a recently boiled kettle into the dish at the bottom of the oven quickly followed by the bread roll dish on the middle shelf of the oven. 12. Allow to bake for 10 minutes before knocking down the temperature to 190ºC for the last 15 minutes. 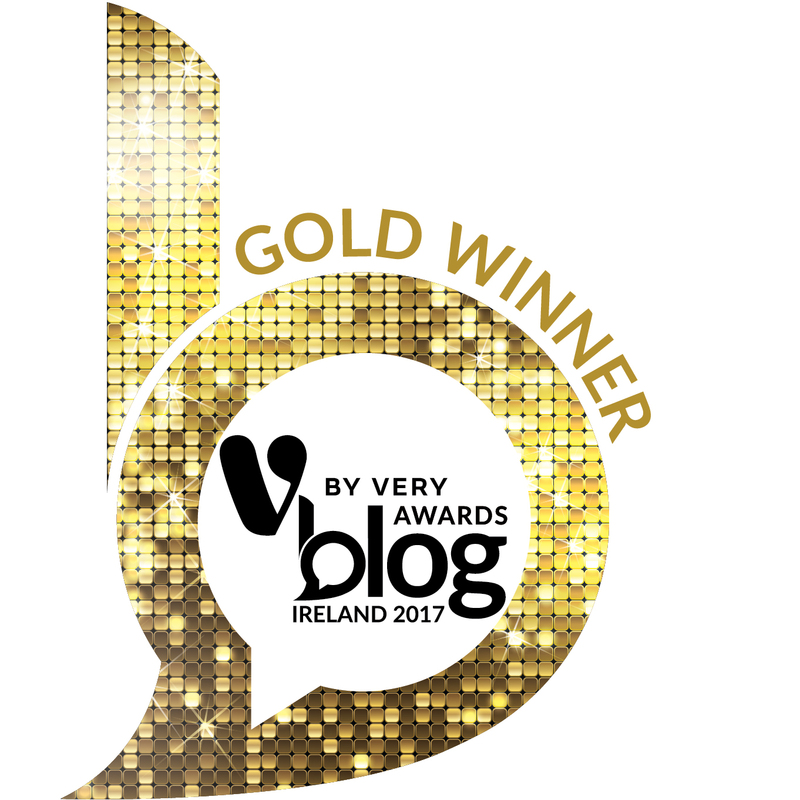 WWW.NATIONALBREADWEEK.IE OR FOLLOW ON TWITTER @LOVEYOURLOAF AND ON FACEBOOK.